Historic Royal Palaces, the independent charity that looks after Kensington Palace, Hampton Court Palace, Tower of London, Banqueting House, Kew Palace and Hillsborough Castle in Northern Ireland, hosted a joint showcase event with leading luxury hotel brand, InterContinental Hotels & Resorts at Kensington Palace last night (19th September). 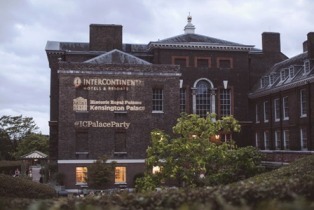 The partnership event was an opportunity for 300 event planners to network with InterContinental Hotels & Resorts from across Europe, while experiencing first-hand the Kensington Palace Pavilion and Historic Royal Palaces’ handpicked suppliers. Newly opened in March 2018, the Pavilion overlooks the palace’s Sunken Garden and Cradle Walk, where guests enjoyed a drinks reception and canapes by Food By Dish to the sounds of a cello and violinist provided by Prelude. 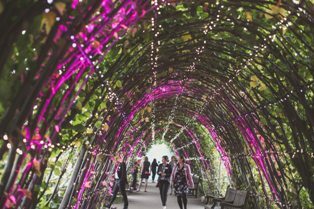 Guests then moved into the Pavilion’s main space which had been decorated with a floral chandelier by Lavender Green, suspended over a circular bar created with bespoke vinyls by Fisher Productions, co-ordinating with the event’s theme of ‘Summer Soiree’. They were then welcomed by Historic Royal Palaces and InterContinental Hotels & Resorts before teaming up for a bespoke quiz created by teambuilding experts Wild Goose, answering questions relating to Kensington Palace and InterContinental Hotels & Resorts for the chance to win prizes on the night. 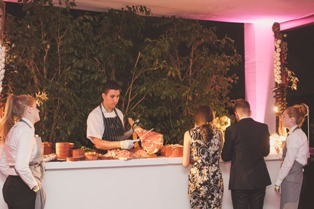 Three food stations then opened for guests to enjoy, serving Mediterranean, British and French cuisine from Food By Dish, with dishes including a whole Iberico ham and escargot with aioli. A dessert station then followed, accompanied by a DJ and after dinner drinks.